Find Post Office Jobs at GovernmentJobs.org. Alternatively, use the official United States Postal Service Job Search Tool below to find employment opportunities within the USPS only. Click the image below to open the USPS Job Search Tool in a new window. Enter in the keywords related to the skills you have or the job title you wish to fill. For example, "post office clerk". Select the U.S. state where you wish to work. Hold down the Ctrl key while clicking to select multiple states. Choose from 25 functional areas. You can select multiple fields by holding down the Ctrl key while you click. The 25 functional areas are: Administrative Support, Communications, Consumer Affairs, Corporate/Government Affairs, Delivery/Customer Service, Engineering, Facilities, Finance & Accounting, Global Business, Human Resources/Labor Relations, Information Technology/Security, Law Enforcement/Inspection Service, Legal/General Counsel, Marketing, Network Operations & Support, Plant Operations, Pricing, Product Information, Property/Asset Management, Retail Operations, Retail Support, Sales, Supply Mgmt/Procurement & Purchasing, Trades and Technical, and Transportation/Logistics. 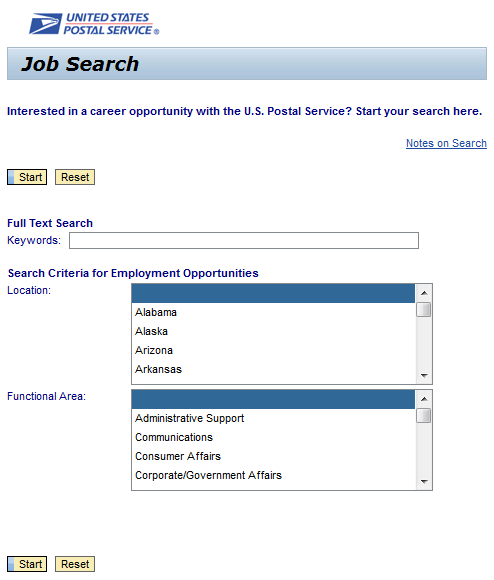 Click "Start" to begin your USPS Job Search. For each job posting, the resulting page will display the job title, the functional area, and the date the job was posted. To apply to a specific job that is listed, click on the job title.